The "Knook" is a needlework tool manufactured by Leisure Arts. It looks like a crochet hook but differs from a traditional crochet hook in that it has a small hole at one end of the hook. The hole is intended to accommodate a cord, which is threaded through the hole. The cord is a necessary and integral part of the Knooking process. Knooking combines aspects of knitting and crochet for patterns that are similar to - but different from - both crafts. People who enjoy either traditional yarn craft can find it really fun to try something new, and Knooking is a great place to start. To prepare the Knook, you need to thread one of the cords through the little hole at the end of the hook. Note that the cord needs to fit snugly in that hole, so it can take a few tries to get it in there. The tight fit is beneficial so don't give up if it takes a little bit of time. After preparing the materials, the next step in Knooking is to work a starting chain. This is basically the same process that a crocheter would be familiar with. From there on out, though, it's a different process from crochet. Holding the hook upside down, you pick up stitches. After you have finished that, then you transfer the stitches onto the cord and turn the work over. Then you work the stitches, transferring each stitch onto the Knook as you go. It's a process that isn't quite knitting, and it isn't quite crocheting. People who have done both crafts before should find it easy to pick up Knooking, while people who have done only one or the other may need a little bit more practice to get the hang of this new craft. The end result is a fabric that definitely looks more knitted than crocheted. The fabric you end up with has the look, feel, texture and drape of a weft knitted fabric. Structurally, the fabrics you create with this tool can be called "knit". That makes Knooking a nice choice for the crocheter who hasn't taken to knitting but wants to create knit-like fabric. The best way to find out if you like Knooking is just to give it a try. The best way to give it a try is to get the Knook Beginner Kit. The beginner's kit includes 3 Knook tools - sizes G - 6 (4.0 mm), H -8 (5.0 mm), and I - 9 (5.5 mm). The beginner's kit for Knooking also includes 3 silky cords and an instruction booklet that teaches you how to Knook and provides you with 4 Knooking patterns to get you started on your way to making items. A small 32-page instruction booklet comes with the Knook Beginner Set. The booklet include instructions to learn how to Knook with photo-rich tutorials for both right-handed and left-handed crafters. Knooking washcloth pattern. It is nice to begin a new niche of crochet with a small project to get that instant gratification satisfaction that makes you feel like you're really learning something. Baby blanket Knooking pattern. This Knooking pattern is made using a textured basketweave stitch. Diamond lap throw pattern. The name of this Knooking pattern comes from the fact that the design is a blanket made of diamond-shaped motifs. Infinity scarf / infinity cowl Knooking pattern. This pattern, worked in garter stitch, is one pattern you could make two different ways; you just change the finishing a bit if you want a cowl instead of a traditional long scarf. The book includes many color photographs which are clear and helpful. 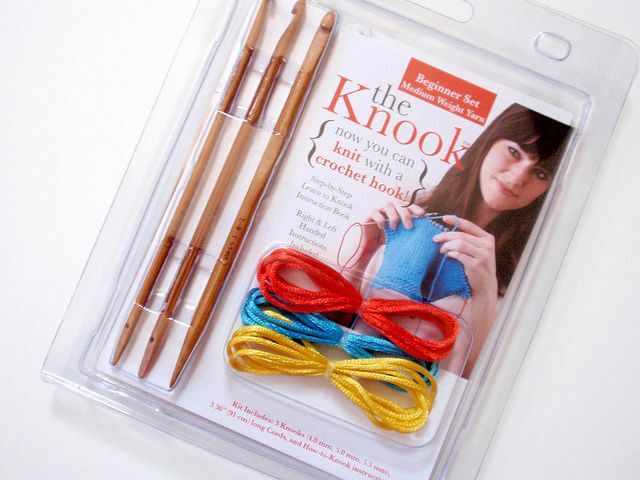 There is also a Knook Beginner Kit for Kids and an Expanded Knook Beginner Kit. The former has larger hooks for little hands, and the latter has more hooks and cords for working in different yarn weights. The only way to find out if you like a craft is to give it a go yourself, but it can be helpful to know in advance what other people say are the easiest and hardest parts of the craft. People who are familiar with knitting and crochet find that their knowledge is an asset in many ways, but that Knooking is just different enough from each of them that it can feel a little awkward at first. However, many people who know all three crafts have said that they found it much easier to learn Knooking than knitting and perhaps even easier than crochet. The motions of Knooking tend to feel less awkward to crocheters than knitters. One downside of the Knook is that there's a cord in your way every time you're trying to make a stitch. There is a learning curve and after some practice this won't feel so cumbersome, but it can be difficult for beginners to get used to. People who already knit successfully may find that there's not a need to add Knooking to their repertoire, while people who prefer crochet may see this as a convenient way to incorporate some knit styles into their work. It is especially handy to be able to switch between Knooking and traditional crochet to create hybrid projects without having to switch back and forth between needles and hooks. The Knook Beginner Set is a good value for the money. The quality of the tools, instructions, and four beginner patterns are all above satisfactory. For those who need a lot of help getting started with a new craft such as this, there are plenty of additional resources available, especially through the Leisure Arts website. Another great resource is the I'd Rather by Knooking Blog. The best available Knooking patterns are the ones found in books dedicated specifically to this niche technique. Leisure Arts has published several of these including Learn to Knook, Knook Dishcloths by Starla Kramer, Simple Scarves Made with the Knook by Margaret Willson, and Cozy Knits Made with the Knook. You can also search Ravelry for Knook patterns (which may be filed under either crochet or knitting so include both in your search); there are about two dozen free Knooking patterns linked through the site. What Is Frogging in Crochet? What's the Difference Between Granny Square Crochet Methods?